So your kitchen is nicely organized, with one exception those pesky pots and pans. 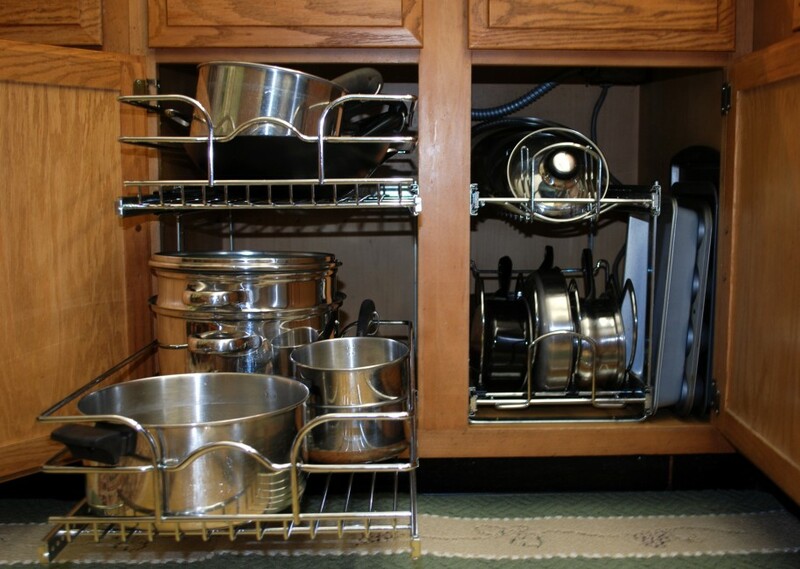 How to store your pots and pans is often a conundrum as they do not easily fit into your kitchen neatly. 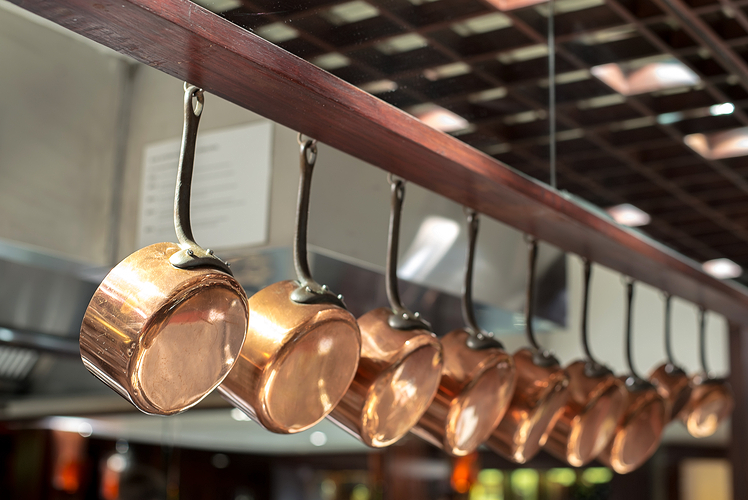 Store your pots and pans in creative ways to include them in your kitchen décor or hide them away in an organized way that it becomes easy to locate the right pot or pan when you need them. Instead of just shoving them in a cupboard in a mess and finding it difficult to get out the pot or pan you actually need consider the approaches that follow to make getting the right kitchen implement a breeze so that you can get to what is really important when you are in the kitchen, making a delicious meal for your family. 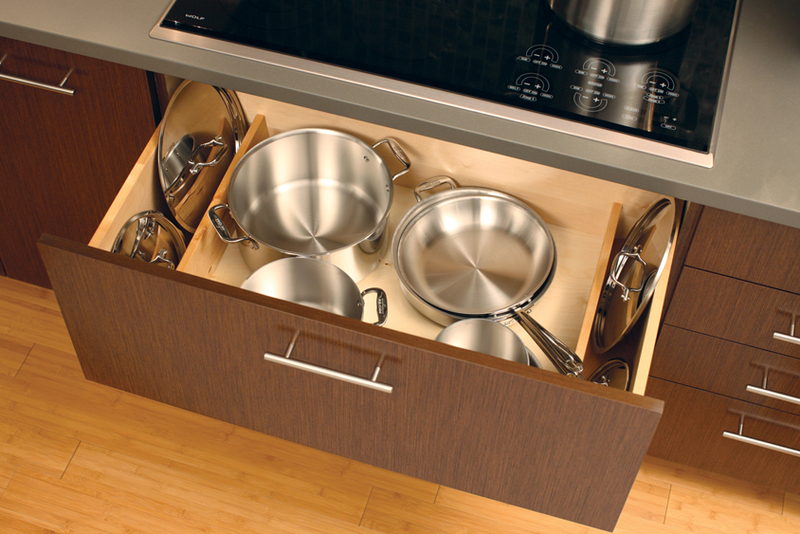 Many convection ovens have a convenient drawer to store or your pots and pans in. They are kept right where you need them most and are hidden out of plain sight. 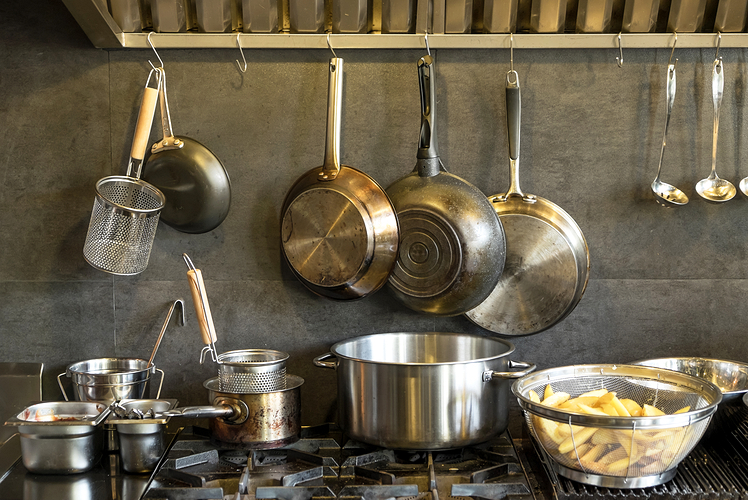 Keep lids on one side under your pans and on the other size keeps your pots neatly stacked together. 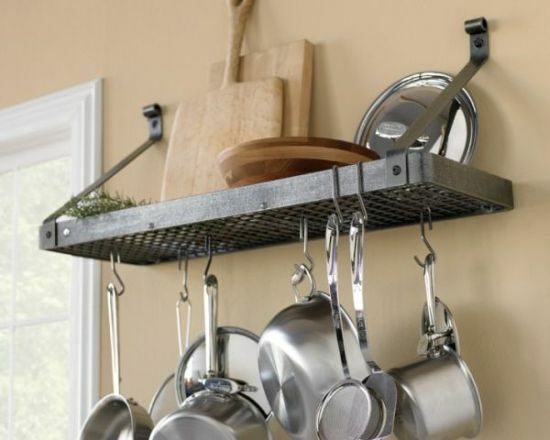 There are many overhead hanging racks you can install above your island to store your pots and pans. 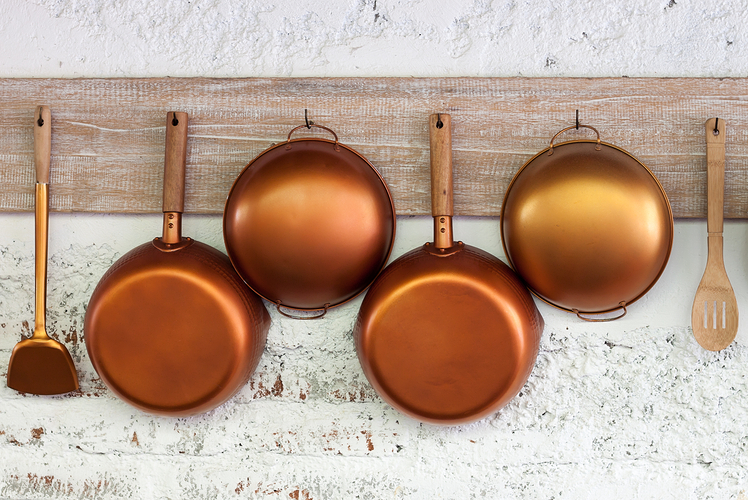 If you have a nice bronze set of pots and pans then you may want to show them off by displaying them. There are as many rack options as they are decorating styles which range from utilitarian to ornate. 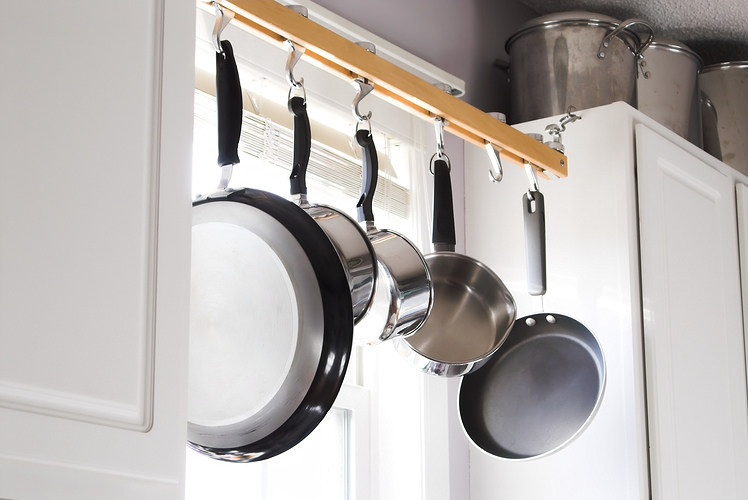 Consider installing a coat rack or hooks into your pantry to hang your pots and pans on. There are many types or hooks that will suit this purpose and this will really allow you to express your personality and you can personalize this option to suit your existing décor, while making selecting the right pot or pan effortless. Use the deep drawers in your island as a convenient way to store your pots and pans out of sight, but not out of your reach. You can easily install home-made dividers or buy them from your local home improvement store. It is usually not recommended to obstruct the view of any windows in the home, however in some circumstances a rule is made to be broken. If your kitchen is already light and airy, then installing a few pans in the top of the window is a conversation starter. Instead of finding a big piece of art on the empty wall space you can use your pots and pans as a piece of visual interest. Try installing a piece of an old ladder or some reclaimed wood from which to hang that pricy pot and pan set you want to proudly show to your dinner guests. Who says art can’t be practical? Either add floating shelves to your kitchen wall or put a shelf above your range. Shelves mean that you will keep the pots and pans neatly stacked for aesthetics and mean that they are easy to access. Consider either a metal shelf or wooden floating shelves. There are many custom ways to store your pots and pans. Custom racks will have spots for lids and different sized pots and pans that will neatly tuck away into a cupboard or drawer of your choosing. Racks come in different sizes and configurations so that they will truly suit your needs. Corner cupboards are typically the cupboard that people struggle to utilize. 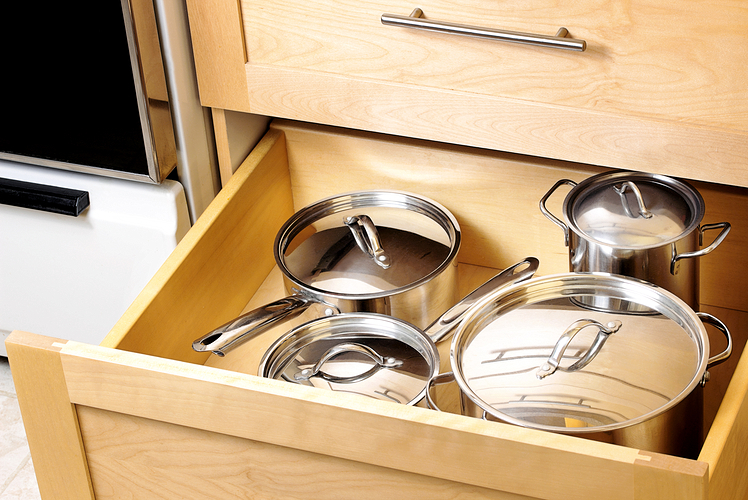 They can be perfect to store your pots and pans in because they are irregularly shaped and sized themselves. 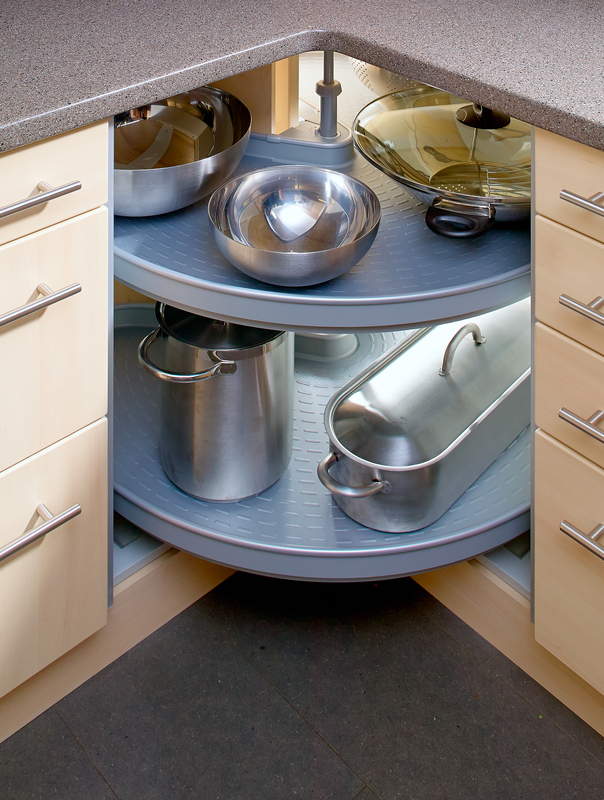 Having a pull out organizer in your corner cupboard can make them extremely convenient to use. 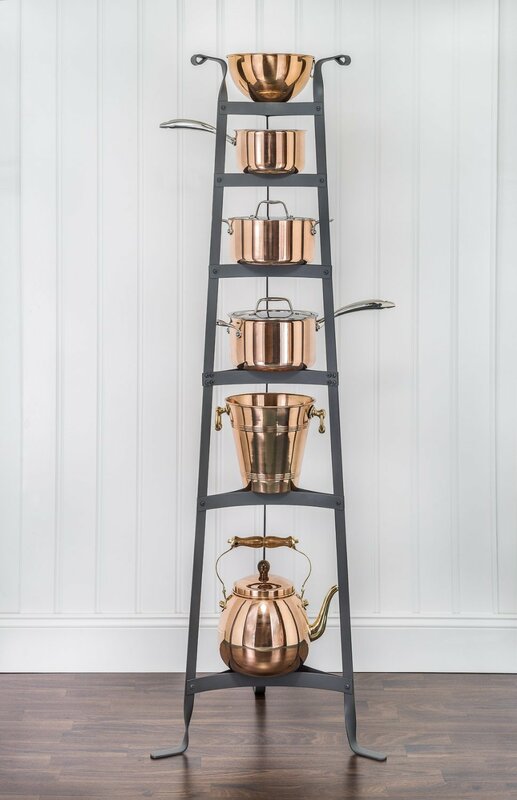 If you have the space in the corner of your kitchen add a stand-alone rack for some visual appeal and the practical purpose of storing the pots and pans that do not fit in your tiny kitchen. Stand alone shelves could be made for the purpose of your pots and pans or could be a repurposed piece of furniture from elsewhere in the home, like a bookcase.